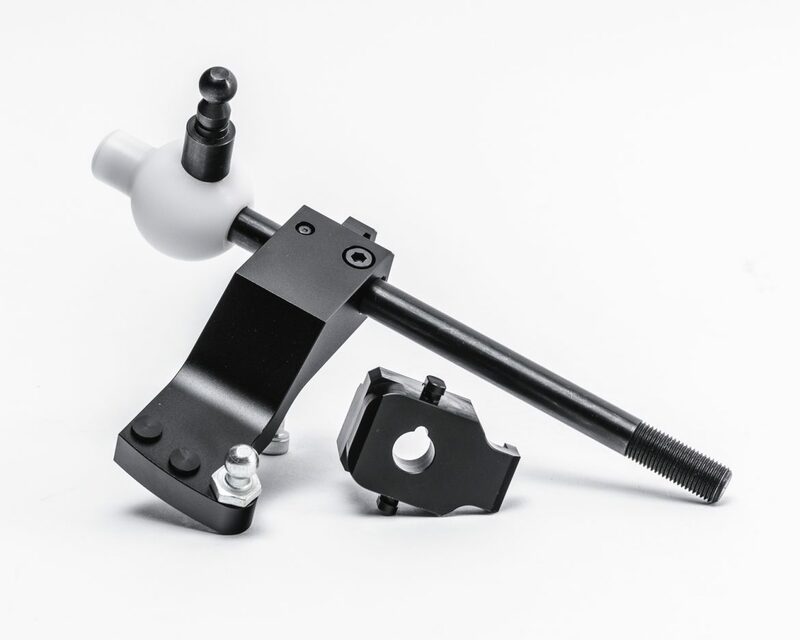 This Install Guide is intended to help with the installation of the Agency Power Short Throw Shifter on a Ford Focus RS. 1. Unscrew the shift knob in a counter clock wise direction to remove. 2. Unclip the shifter outside trim. 3. Remove the passenger air bag light panel between the radio control panel and the HVAC bezel. Unscrew the bolts holding the HVAC bezel trim and remove. To remove pull up and backward. 4. Unclip and disconnect the electrical connections behind the HVAC and around the shifter bezel. 5. Unhook the shifter links and cables. Unscrew the bolts holding the shifter assembly and remove the assembly. 6. Pull out the side shift pivot pin. To do this you will need to unclip the pin with from the bottom of the assembly. 7. Remove the side shift arm to gain access to the shift bushing, centering spring and rubber grommet. 8. Remove the side shift bushing, the centering spring and the rubber grommet from the assembly. 9. Unscrew the bolts on the shifter cover. Unclip the shifter cover latch. Separate the shifter cover and the lever assembly. 10. Carefully remove the shifter lever bushing. 11. Remove the shifter lever arm from the cover. For easiest removal slightly file down the edge of bottom factory arm that extends from ball to allow to clear cover. 12. Unhook the factory reverse lock. Install the new reverse lock out. On the hooks find the front side by locating the tab. Hook the factory loops to the new reverse lock out supports on the front with opening and back side. The front (side with opening) will need to have the factory loops trimmed to be flush with the opening of the new reverse lock out. 13. Install the new shift lever into the factory shifter cover. 14. On the shifter ball apply small amount of synthetic grease and clip on the shifter lever bushing. 15. Clip and re-screw the shifter cover back onto the shifter base. 16. Re-install the rubber grommet, the side shift bushing and centering spring. 17. Insert the side shaft busing into the side shift arm. Tap the side shift pivot pin into position and secure. 18. Re-install the shifter cables and links. 19. Re-bolt the shifter assembly in place. 20. Place the reverse lock into position on the shift lever. Re-install the shifter cover and snap into place. Be-sure to reconnect any unplugged harnesses. 21. Reconnect harness and re-install the trim between radio and HVAC. 22. Re-install the removed shifter trim. Re-install the shift knob turning in a clockwise direction until the reverse lock stops catching on the shifter cover. 23. Congratulations you have installed the Agency Power Focus RS Short Throw Shifter.